A couple of days ago I mentioned this recipe for using steak, chops or chicken in foil or parchment packets along with corn on the cob and potatoes….. only to realize that I had never shared the recipe before. (I know it may be hard to believe, but I’m a blonde…. and it’s natural *don’t judge*). Lay each piece of foil or parchment out flat. Center the chosen cut of meat on the foil or parchment. Season each piece of meat with a teaspoon of Worcestershire sauce or A-1. Now place the potato quarters on top of the meat and lightly season with the seasoned salt and pepper. Place the cob of corn on top of the potatoes followed by the onion. Season the top of the pile with seasoned salt and ground black pepper to taste. Now you are going ot make a packet out of each one by bringing up opposite sides of the foil or parchment to the middle, it should be centered over your pile when you bring them up. Roll the foil or parchment down to secure it well in the middle. Now fold each end up by folding it towards the middle. You just want to make sure that all sides are closed up on the packets so nothing will escape during cooking process. Place something in the bottom of your crock pot (I use canning lid rings or make aluminum foil balls) that will not allow the packets to come in direct contact with the crock pot bottom. Place the packets of meat and veggies on top of that. Don’t stack these packets too tightly. Steam will form inside the packets during cooking and will need a little room for expansion. I use a 6 quart crock pot and 4 of these packets fit perfectly. Cook on high for 3 – 4 hours or on low for 6 – 8 hours. I don’t have any pictures to share, but I will as soon as I make these again. These are perfect if everyone wants something different for dinner too. You could even do what my mama did and make these with the hamburger patties if that’s what you wanted or if that’s what your budget allows. 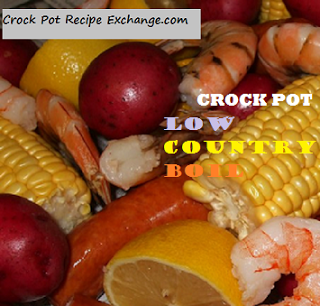 This recipe shared at $5 Dinner Mom, Potluck Sunday, Foodie Friday and GCC.